A single word is etched onto the inside of the weapons casing, “Soon”. No one knows the true point in space and time where the No Time to Explain originated. 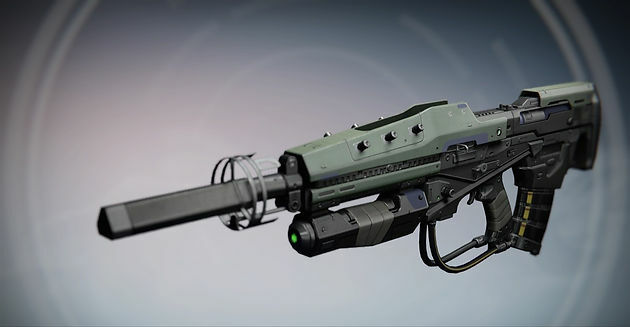 Novarro’s timeline analysis indicates that this weapon is the Strangers Rifle, give by the Exo Stranger to a Guardian after the destruction of the Black Gardens heart. The Rifle was modified at some point in the future and sent back to the time of our Guardians. Deliah’s timeline analysis indicates that No Time to Explain was built by Praedyth himself, one of the three ill fated members of the first fireteam to breach the Vault of Glass. He supposedly built his own version of the Strangers Rifle and then sent it adrift in time. Hari’s timeline analysis states that this weapon was designed and built by beings of undefinable origin and sent to us by a mere accident. A blessing in many Guardians eyes. Inachis’ timeline analysis indicates that this weapon was forged on Earth during the late Golden Age where it will eventually be lost to the ripples and waves of time itself. Whereon it will degrade and its systems will downgrade until it is returned to our past as the Strangers Rifle. However it got here, the No Time to Explain definitely has some interesting and fun features that the present Guardians will make use of. The No Time to Explain is a pulse rifle of the mid rate of fire and high impact archetype that is well suited for almost any encounter. If you just considered its archetype, it may not be considered to be anything special, however it possesses the intrinsic perk, Full Auto which allows this exotic to be fired in a continuous series of bursts until you need to reload. Its exotic perk is known as Rewind Again which allows any bullets that scored a precision hit to be returned to the magazine without the weapon reloading. In essence, if you time and pace your shots correctly, you can have almost infinite ammunition. However most of the time this would be too arduous and random to achieve against low level enemies. The No Time to Explain has a major focus on PVE activities particularly against Ultra level bosses, where precision shots are easy to score – Septiks Prime for example. Due to its relatively stable recoil and Rewind Again, your Guardian can consistently score precision hits in an unending spray of bullets. A common argument against this is that it is only a primary and lacks the damage to quickly eliminate your targets and this may be true but having this exotic at the ready for when you run out of special and heavy ammunition can be a breath of fresh air without the need for reloading. In PVP, the No Time to Explain has a time to shine, as long as you play smarter when going up against faster firing weapons or close range weaponry. It boasts an impressive range so the middling ranges of play are where this pulse rifle will shine, especially with that Full Auto. In relation to looks, the No Time to Explain is in essence, very similar and almost identical to the legendary Strangers Rifle. The frame is of a basic design, with a green colouration covering it and a curved magazine that flows from the back of the gun towards the middle. The most intriguing feature of this exotic pulse rifle are the two concentric rings around the triangular muzzle of the weapon. When in play, these rings are covered in the time warping light of a Vex gate. It is bright and white and so definitely plays into this weapon having Vex connections. I hope you are ready for a bit of a trek in order to get this exotic because it is going to take a while. First you will need to have collected the Cult Ghost from selecting the Paradox Mission on Venus, changing the mode to the Hard one (it should say the recommended Light) and then collecting the four hidden Ghosts within this mission. Once you have gained the final Ghost, the Cult Ghost that has Future War Cult Markings, you need to return it to Lakshmi-2 who is located in the Hangar Bay of the Tower. Once you turn in the Ghost, you have to wait until she decides to provide you with a new quest. It is not known how long you will have to wait for this quest to become active. Once you receive the quest titled, Not Forged in Light you will have to pledge your allegiance to the Future War Cult and then after that donate materials and/or Motes of Light in order to accrue 1000 reputation. Lakshmi will then require you to kill a Taken Minotaur and collect a Simulation Core that they will drop. This is easily done, as you will just have to head to Venus on a Patrol and wait for a Taken event to begin. Eliminate the Take Lieutenants and hope one of them drops a core. You must then shatter the Simulation Core (dismantle it) and head back to Lakshmi-2. At this point, the leader of the FWC will ask you to defeat Atheon, Times Conflux in the Vault of Glass. This can be done on Hard or Normal so don’t sweat it if you do not feel up to the challenge. Although at your assumed Light level, older Raid activities should not be too difficult to overcome. Grab a Fireteam and head back into the Vault. Once you defeat old Athy, you need to collect his eye that he drops, shatter this once again and head on back to Lakshmi. You will now have access to the mission known as Shadow at Twilight. This is a mission recommended for those 270 Light and above so make sure you pass the bar. This mission requires you to find and open a chest that spawns at different locations around the Twilight Gap Crucible arena. You will be damaged by a Dark aura that is spread around the environment so be sure to cleanse yourself in the patches of Light left there by legendary Gunslinger, Ana Bray. Find and loot the chest and return to Lakshmi. For your final challenge you will need to complete one last mission entitled Blood of the Garden. This requires you to be 290 or higher with your Light level so get that Light up there Guardians. It would also be recommended to bring in a full Fireteam with you as this mission can get a little hectic while doing it solo. You will need to kill the enemies that spawn around the map to get the Anger Meter up to 100% which will summon the Taken Boss. Keep that Meter at 100% and eliminate the Ultra and you are finished. Within a full Fireteam, two members can focus on add control while the final member can take out the boss. Return to Lakshmi-2 and collect your reward. The No Time to Explain is now yours.